Non-arrival guests, who are unable to attend or fail to attend for whatever reason forfeit their deposit and the full amount of the booking will be due. In the rare event we need to cancel your booking with us, we will refund any payment already made. Please be aware that we cannot be held liable for circumstances beyond our control that result in us having to cancel your booking. To place a booking with us the lead guest must be at least 18 years of age. The maximum number of staying guests per room is illustrated in the room occupancy details on the website and any booking platforms we use. Where the person making the booking is different to the lead guest taking up the occupation, the person making the booking may be held responsible for cancellation, non-arrival, and damages as set out within. To secure any booking we require a deposit to be paid in advance, this deposit amount is equal to the cost of the first nights stay. Deposit payments must be 'cleared funds' before a booking can be confirmed. Deposits are only refundable under the conditions set out here within. Payments can be made online, over the phone using a debit or credit card, by digital bank transfer, cheque. Any charges raised against us by our banks for handling dishonoured cheques, bank transfers, or any other payments must be reimbursed by the lead guest within seven (7) days of any request to do so. All guests agree to respect the privacy and peace of all other guests, neighbours and the owners at all times. We reserve the right to cancel a booking with immediate effect if guests are not honouring this agreement or causing a disturbance/nuisance to other guests, neighbours or the owners. Check-out: by 11am on day of departure. Late check-out is available at a rate of £10 per hour after 11am up to 1pm. In the rare event, we need to cancel your booking with us, we will refund any payment already made. Please be aware that we cannot be held liable for circumstances beyond our control that result in us having to cancel your booking. Any lost property, if discovered and found, left behind by guests during a stay will be held for a period of 1 month. While we will make our best efforts to reunite lost property with their owners we accept no responsibility in replacing lost items and encourage guests to ensure they have all their belonging before checking-out. We may offer to post lost items via recorded delivery at the cost of the property owner, otherwise, collection can be arranged. Smoking of any tobacco products including, but not limited to cigarettes, pipes, cigars, snuff, chewing tobacco, e-cigarettes or vaping is only allowed in designated areas as sign posted throughout the accommodation and is in accordance with the Health Act 2006. Anyone caught smoking inside their room or anywhere else inside the premises will incur a fine of £150 which will be automatically added onto their bill. While the bar and restaurant area of our property is dog-friendly (as long as your dog is well trained and sociable with other dogs), we have a strict no-animal policy within our hotel rooms. This includes any service animals. Every computer connected to the internet is provided with adomain name and an IP Address. When a visitor requests a web page from withinthe astontavern.co.uk domain, our servers automatically identify and log theHTTP / HTTPS request that is made. This information reveals nothing personal about you. Infact, the only information that we automatically gather and log is as follows:the IP address of the site that may have referred you, your IP address, the webpage that you may have linked to us from, if any, the product identifier forversion and make of browser (e.g. Internet Explorer 8), the operating systemplatform that you may be running (e.g. Macintosh or Windows), search words orterms that are passed from a search engine (e.g. Google or Yahoo). We at The Aston Tavern find it advantageous to examinevisitor traffic so that we can ensure maximum compatibility for the variousbrowsers and operating systems that visit our site. By analysing visitationpatterns, referring URLs and search engine terms, we can strategically enhanceour exposure across the internet. Learn how to removecookies set on your device. We use a number of suppliers who may also set cookies ontheir websites on its behalf. The Aston Tavern does not control thedissemination of these cookies. You should check the third party websites formore information about these. What otherinformation does The Aston Tavern request? We may also request your email address or mailing addressfor the purposes of conducting a survey or to add you to our mailing list, orby your request to have someone contact you for additional information.Whenever we request the identity of a visitor, we will clearly indicate thepurpose of the enquiry before the information is requested. The Aston Tavern will only send out marketing materials if you have opted-in to our mailing list. NEED TO WRITE THIS SECTION - CLOUD BEDS EMAIL OPT IN INFO, E.G. SENDING EMAILS TO PEOPLE ONCE THEY BOOK/CHECK-IN/CHECK-OUT WITH AUTOMATED CONTENT ETC. DO PEOPLE NEED TO OPT IN FOR THIS? 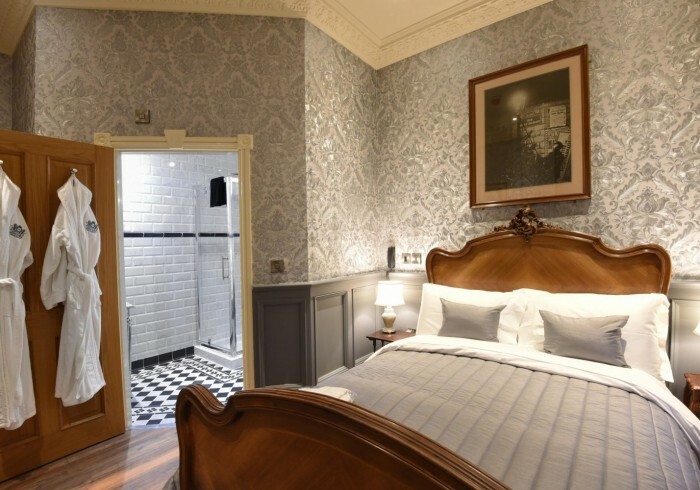 The Aston Tavern offers 17 luxury, bespoke bedrooms in a beautiful Victorian venue. A breath-taking listed building steeped in history, The Aston Tavern stood derelict for 23 years but has been restored to more than its former glory. Paul and Michelle took on the task in 2013 and since the dramatic transformation it has gone from strength to strength. Hosting weddings, conferences, summer parties, open air cinemas and more, the business has grown and become the “Hidden Gem of Aston”. Situated just outside of Birmingham City Centre, our deluxe hotel offers an escape from the hustle and bustle of the city and allows you to unwind and relax. Fitted with four poster beds, Sky TV, free WiFi and luxury mini bar, our double, king size, bridal suite and family rooms are complete with a range of amenities to make your stay everything you could hope for. Whether you are visiting us for business or pleasure, our breath-taking bar with extensive menu, distinguished restaurant and inviting staff will make your stay one you will never forget. Experience a truly stunning Victorian atmosphere without sacrificing the luxuries of a modern hotel.